Feature & Function Updates implemented in the last maintenance cycle. Critical Issues - make sure your course is not impacted! Respondus Access - test creation software. For annual license renewal instructions, see the "UNM Learn Resource - Respondus course" in your My Learn course list for details. Getting Started - things that will help you begin working on your course. Building your course Tips, descriptions and instructions for creating and editing your course. Assessments Tips, descriptions and instructions for Tests, Assignments and the Self and Peer Assessment tool. Look for the menu to select a different course menu item; if you have no options, you must either add content to an existing hidden page or use the plus (+) sign at the top of the menu to add something that will be visible immediately, even temporarily, such as Announcements or the Calendar. If you choose "Content Area", you will still have to add content to that page. Go to Course Management ==> Customization ==> Teaching Style and choose the entry point from the menu. Test what the students see with the "Student View" button in the upper right corner. The Learn Course Menu is customizable; links can be in any order you like, named to match your syllabus, and dividers can separate parts of the menu. Having good navigation should reduce emails and conversations about where to find things in your course. You can place text any where on a content page, to present information immediately without forcing students to open a document for instruction. Combining text with links to course elements will be of huge help to most students. Provide either space to continue a powerful conversation, or to allow students to post research a topic from your campus class to keep them engaged until the next class meeting. Be consistent; if you want your students to go into the course regularly, resist the temptation to send them documents by email. Force them to go to the course for everything you can. Make your content area and folder structure simple, so you can get things done quickly. Have a large number of readings? Attach a folder in your content collection to an item for a week or a topic. Students will see the documents in alphabetical order and will be able to download all as a zip file or individually. This lets you arrange your documents in the context of other elements for the week (or topic - whatever organization you have). Using Rubrics for assignment grading, class participation or anything you can define within the structure of a rubric. You can use points, a point range, percentage or just use the tool to create a chart for performance criteria. Use tests to help the students study, especially if you have a test bank from a publisher. You can draw questions randomly from a pool, allow them to take the test more than once with a new set of questions each time. Record a score for their feedback whether you want to include it in the grade center or not. If you want to grade it, one way would be to allow multiple attempts and record the average grade to encourage having read the course material. Uploading materials in advance of a lecture or class meeting about an upcoming project could help students be prepared with questions. Use a wiki for collaborative learning. Learn has a built-in wiki tool that allows you to create multiple wikis for individual or group work. You will be able to grade individual contributions; in fact, you will be able to see when and to what extent individual students contributed. Provide a means where students can ask questions or comment on course content or activities, for the whole class to share. Set the forum or blog up to allow subscription and tell your students about the option; you all can receive postings by email. If you are able to answer a question quickly it might save another student from wondering or worrying. Show your students this tool, it may help them to quickly check if there are critical additions to the course. You can add a link to anything in the course to your announcement as a reminder and to give students a quick link to the work that needs to be done. UNM Preferred Email. 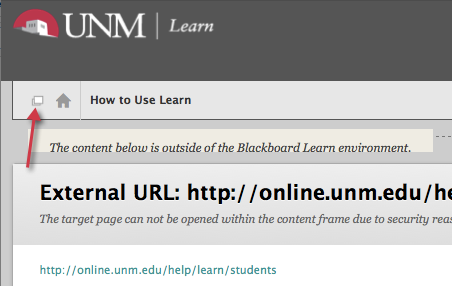 Many of the tools in the course forward email messages to the students UNM email account. Encourage students to go to http://dss.unm.edu to make sure they are getting course email in the account they regularly check. Use the Grade Center and My Grades to keep from taking up valuable classroom time distributing grades.